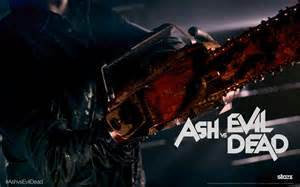 "The man, the myth and the chainsaw return in the official trailer for the STARZ Original Series Ash vs Evil Dead, premiering this Halloween." The official Facebook page for the the new original series starring Bruce Campbell, just released the full trailer and it's well...groovy. October 31 at 9 p.m. ET. Be there. The man, the myth and the chainsaw return in the official trailer for the STARZ Original Series Ash vs Evil Dead, premiering this Halloween.